Home » COMIC BOOKS » Stranger Reads – Comics Log 2017.2.28, More Recent Reads..
Hey, some more comic read from the previous weeks! PICK OF THE WEEK! I love this particular issue, which practically reinvents the series to where I thought this going. This is a good thing, as I was hoping the writing would stay away from the novelty of talking animal apocalypse melodrama, and straight into something oddly more serious and emotionally driven. This being the relationships between humans and animals, now that we have this surreal understanding. Everything about this issue is great, from the intro of philosophizing shrimp to the chilling foreshadowing hinted ahead. In between, are fantastic moments and thoughtful character development, especially of Sandor the dog; who comes off as a badass, yet caring. Jesse also develops, in more than ways than I expected (a very surprise moment I best not spoil). The art and coloring continue to give this series set the tone, with an added touches that flesh the world of Animosity into a strangely believable one. A good concept from a favorite writer. There is something about the set-up that seems bothering. The soldiers after living the long runs, seem somewhat unfulfilled on what to do with it all. I would hope there is some direction in the way of making sense of it all. Though, they find themselves easily manipulated. For what reasons, we shall soon see. The problem is not having as much to identify with the characters, in an ugly horrible world of war and death around. I like the art and interesting use of panel storytelling, especially the high point of intense violence. I feel there is something worth a payoff in the overall story, but not visible yet. The Star Trek Beyond film is my favorite of the new Trek films. 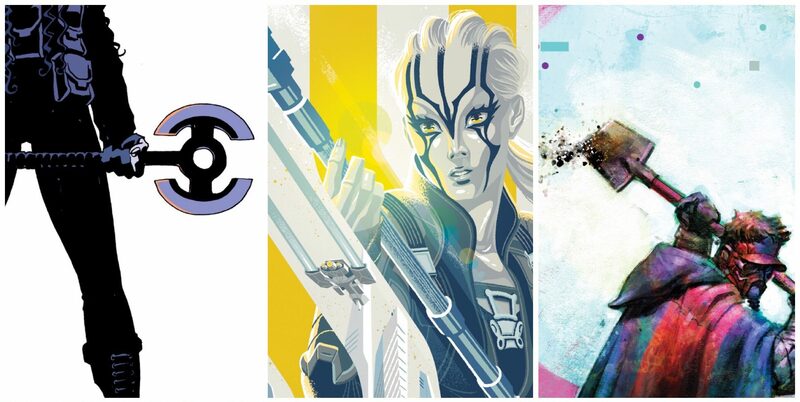 Much of that because I liked the character of Jaylah, but felt there could have been more to her. This particular issue delivers her back story, and strengthening her character further. To what direction could this mean? I wish she did not join Starfleet, and kind of continued on a sort of anti-hero or rebel. Still, I hope for something new and fresh from her in this new Star Trek series, and not rehashing old elements (like recent Borg storyline in the previous arc). The art was all right, but hoping for something a bit more vibrant in the coming issues. Finally, comes a satisfiable explanation to much of the mystery of this great series. Its time was very much due, and such is more than expected, all with the usual awesome coloring and art. Pollux’s back story prior to the series is interesting, towards a reaction of where emotions can vary, depending on the reader. Pollux sudden actions to an impossible situation ends tragically. The fact that he lives through it all and not succumbing to regret and despair; enabling a good hero for the tough times ahead. I look forward to seeing where his character and overall story arc heads and ends. Then, I will reread the entire series to fully appreciate the added dimensions, which felt a hidden in the earlier issues.